When Anthony Joshua fights Wladimir Klitschko at Wembley Arena on Saturday evening, he will go into the bout as a firm favourite bearing the hopes and dreams of British boxing on his shoulders. It's a point that has been restated a thousand times at least, but the fight game on these shores has declined substantially since the golden era of the nineties, and the national boxing establishment is desperate to lay claim to a talent who can haul them back to prominence on the world stage. While Tyson Fury might be able to throw suitably thunderous punches, he is never going to be the global endorsements phenomenon they need, living as he does within a perfect storm of anti-doping issues, an embarrassing social media presence, scattergun bigotry, and general instability. Despite the odd controversy here and there, Joshua seems like a handsome, clean-cut good guy relative to Fury's beefy, leering antagonist. Combined with his unbeaten professional record, that means the Watford-born fighter best fits the bill. Should Joshua beat Klitschko this weekend, he will no doubt be hailed as the next man to establish hegemony over heavyweight boxing. While Fury and the erratic team around him found that beating Klitschko only flung open a Pandora's box of public scrutiny – an eventuality they were incapable of dealing with – Joshua seems to have a far more stable behind-the-scenes set up which, if he wins, should leave him better poised to capitalise on his success. Joshua's promoter Eddie Hearn has already said: "I believe victory this Saturday will make him the biggest star in British sport, and probably the biggest star in world boxing," putting the wheels in motion for an enormous marketing and publicity drive in the aftermath of his expected triumph. What some seem to be forgetting, however, is that said triumph is nowhere near a done thing. There is a reason that, despite being 41 years old, Klitschko's scalp is still worth something in the world of boxing. The effects of the ageing process may have been exposed somewhat in his clash with Fury – a man 13 years his junior – but Klitschko is nonetheless one of the greatest fighters of his generation. Alongside his brother Vitali, he was once the man to reignite the hopes of a nation, spending almost a decade at the top of the heavyweight rankings and helping to establish Ukrainian dominance over the division. He holds the record for having vanquished the most undefeated boxers at 12, and remains the second longest reigning heavyweight champion of all time. Though Joshua might be almost a decade and a half younger than Klitschko, the experience of the latter cannot be underestimated. He is a hugely formidable prospect and, whatever the odds given by betting companies, an upset is a distinct possibility when a seasoned campaigner of his calibre is involved. Likewise, Klitschko will remember better than Joshua another match in which a bright young hope was shocked by a weatherbeaten pro, and may well be able use his memories of that bout to his psychological advantage. He was that bright young hope, after all, while the weatherbeaten pro was called Ross Puritty and the backdrop to the fight was late-nineties Kiev. Klitschko's TKO loss that night may well serve as a valuable precedent, given that he is now the grizzled veteran and his role in the fight game has been reversed. 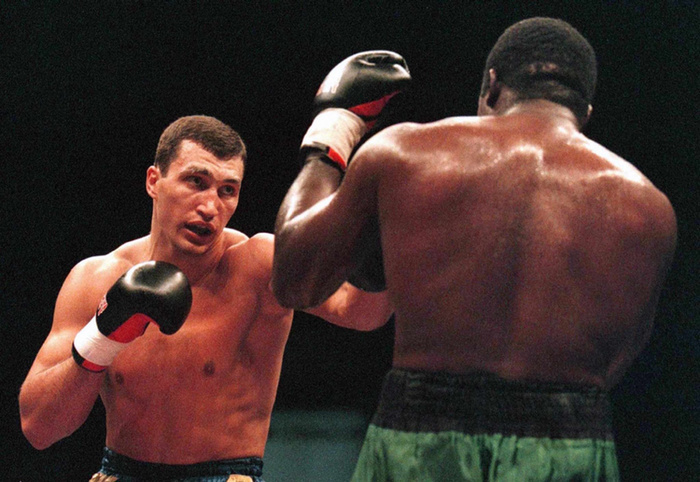 Back in 1998, Klitschko was also an unbeaten youngster with the weight of expectation bearing down on him. He had gone 24 professional fights without defeat – Joshua currently has 18 – and much like Joshua he had been propelled to fame by recently winning an Olympic gold. Klitschko had contested almost all of his fights on German soil, winning the WBC International heavyweight title in Stuttgart in February 1998, and defending it twice more over the summer. Klitschko would fight a whopping nine times that year, with his final bout scheduled at short notice for December against the resolute though fallible Ross 'The Boss' Puritty. While Puritty was nowhere near the standard of fighter that Klitschko is now, he was a dogged competitor who understood the sweet science well. Having made a choppy start to his career, he had put together 10 and five-bout winning streaks, beating some respectable fighters like the enormous Jorge Luis Gonzalez and Native American challenger Joe Hipp. He came into the fight against Klitschko with a record of two wins and three defeats from his previous five bouts, having lost to famous names like Chris Byrd, Larry Donald and South African Corrie Sanders, the latter of whom would coincidentally go on to beat Klitschko in a massive upset over two rounds in 2003. Puritty was 32 years of age at the time of his clash with Klitschko, which although hardly ancient for a boxer meant that his opponent was a full 10 years his junior. Somewhat like Klitschko, then, Puritty was the older boxer expected to get knocked down by the up-and-coming champion. Again, the odds on Puritty beating Klitschko were far longer than they are on Klitschko winning this Saturday, with 'The Boss' never having reached the heights that Klitschko has in his career. That said, there are other clear parallels between the two fights, not least the pressure on Klitschko to keep winning at a time when he was also meant to be a national hero in the making. With both he and Vitali on prodigious unbeaten streaks at this point, Ukraine had unearthed a pair of sporting demigods at a formative time for the country's identity, what with their recent schism from the Soviet Union and the collapse of the Eastern Bloc several years before. Like a Ukrainian Castor and Pollux, those original godlike brothers of boxing, Vitali and Wladimir had been bestowed with the status of stars and had to live up to their national standing. Though, by the late nineties, they were not quite at the stage of picking up Orders of Merit, successfully running for political office or being greeted by cheering crowds everywhere they went, they were still living, breathing symbols of an independent Ukraine's success. Much as Joshua is now tasked with reviving the fortunes of British boxing – albeit for corporate as much as patriotic reasons – Wladimir was one half of a two-man sporting revolution in his homeland. So too was he the home fighter, with the bout against Puritty the first and last that the younger Klitschko would contest in Ukraine. The fight took place in the Palace of Sports in Kiev, with Klitschko defending his WBC International heavyweight title in front of a vocal crowd of his compatriots. Just as Joshua will step into the ring on Saturday urged on by thousands of partisan spectators at Wembley – this for the IBF, vacant WBA (Super) and IBO heavyweight titles – so too did Klitschko face off against Puritty while roared to victory by Kievan fans. The bout was finalised so late on that Puritty had just over a week to prepare, though having fought only three fights that year this arguably helped to keep him fresh. Klitschko, meanwhile, had flown halfway across the world that year and travelled all around Germany fighting, the accumulative fatigue of which perhaps contributed to what happened when the two went toe to toe. Though Klitschko dominated the majority of the match, pummelling Puritty with gargantuan hits, the older fighter remained cagey and judicious while playing to his strengths. Against a big-punching boxer with a greater reach, he fought cautiously and attacked in bursts, conserving his energy while encouraging his impatient foe to waste much of his own in search of an elusive KO. Puritty soaked up brutal punishment to his high guard, coaxing his younger, sprightlier and fitter opponent into ever more draining feats of athleticism and taking a few big clumps along the way. Then, with Klitschko well ahead on the judges' scorecards but otherwise lagging and struggling with exhaustion, Puritty connected with a flurry of punches that first made Klitschko slip and fall, and then sent him stumbling back on to the ropes in the last few seconds of the 10th. Taking a pummelling come the beginning of the 11th round and with his ability to defend himself all but evaporated, a shattered Klitschko was spared further battering by his trainer Fritz Sdunek, who intervened to stop the fight. Raising his arms in triumph and punching the air with a scream of elation, Puritty celebrated his victory in front of a bemused and disappointed sea of spectators. The older, more experienced warrior had upset the odds and beaten the home fighter, silencing the many fans in attendance who had thought the bout was a foregone conclusion. Though that was to Wladimir Klitschko's detriment back then, he will be a very happy man should we find ourselves writing that same sentence come Saturday. While Wladimir Klitschko cannot be compared to Ross Puritty in his strategic outlook or the standard of his boxing, there is still something he can take from that fight all those years ago. There has been a change of places since then, and he now finds himself in an inverted position as far as the predicted career arc of the two challengers goes. When he steps into the ring with Anthony Joshua, he will go up against a confident young fighter who has a reputation as a big hitter and a habit for knockouts, with the English boxer's 18 KOs not so different to his own record ahead the Puritty fight, which stood at 21. As such, he should be able to see something of himself in Joshua, a statement which is not in this case a mere platitude but rather the key to a surprise result. Though Joshua has fought all of his bouts on English soil, the bright lights and vast crowd of Wembley will still only add to the stress and sense of expectation. Speaking about his loss to Puritty in hindsight, Klitschko said: "I was unable to control my emotions in front of my countrymen in Kiev. Usually, I am able to stay cool inside the ring. That night, I wasn't." If he can find a way to ramp up that same pressure on Joshua, he too may find an overeager young opponent chasing a knockout he cannot deliver. Then, whatever the odds, all it takes is one massive left hook, which even in the twilight of his career Wladimir Klitschko is more than capable of delivering. 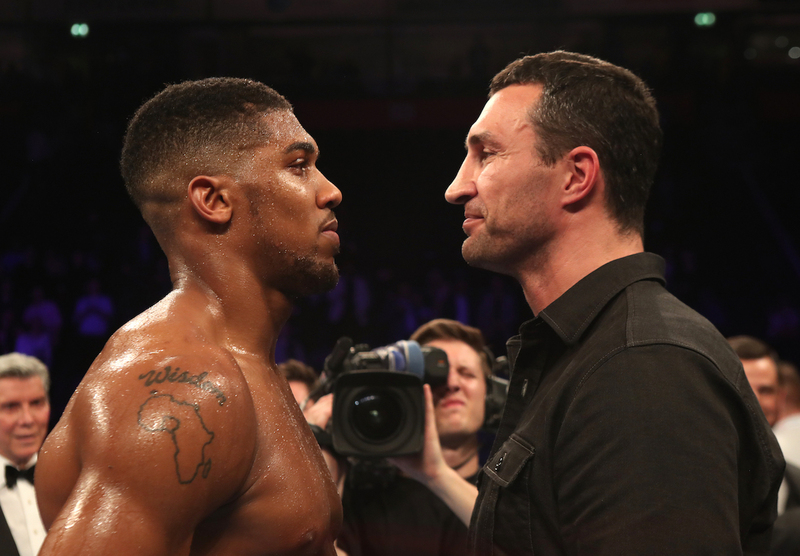 Can Anthony Joshua-Wladimir Klitschko Reignite Heavyweight Boxing in America?